This year we had the gospel reading from Mark and his account of the women going to the tomb. Unlike the resurrection accounts in the other gospels it ends on a rather odd note. The theology think-tank Theos, some time ago, carried out a survey to find out how many people actually believed in the resurrection of Jesus. Theos believes that you cannot understand the modern world without understanding religion, and was particularly interested in belief in the resurrection and how that correlated with people’s stated religious affiliation. Apparently, according to their survey, 57% of people believed that Jesus rose from the dead. Mind you, one can’t always take statistics too seriously. In the survey, of those who identified themselves as atheists 12% thought Jesus was raised from the dead and 7% thought he was the Son of God. There would seem to be some very confused atheists about. Well, the disciples may not have been confused atheists, but there were certainly some very confused believers on that first Easter Day. The gospels tell us how those who were there at the time of the crucifixion – the disciples who fled, the women and John who stayed and watched, thought it was all over. Their teacher was dead – what had been the point of it all? 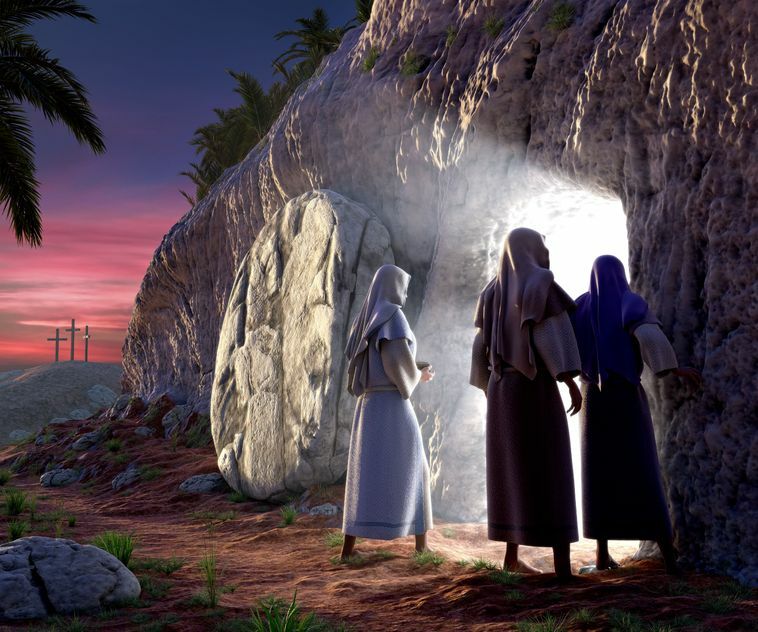 It wasn’t until they came face to face with an empty tomb and a risen Jesus that the truth about Jesus – who he was and why he had come and why he had died – began to dawn upon them. For on that first Easter Day, the disciples not only witnessed the most important event in human history – they also realised a truth which up until then they had been unable to see. Jesus had tried to explain to them what he was about, who he was, why he had come – but they never really understood. Let’s face it – the disciples weren’t always particularly bright. And the realisation of what had happened sometime between the burial of Jesus and the discovery that his tomb was empty took time to sink in. And as Mark tells the story, even when confronted with an angel in the tomb telling them that Jesus has been raised and that they would see him in Galilee, they just don’t get it. One of the difficulties we have with Mark’s gospel is how it ends. If you look in your Bible you will find that it goes on for another 12 verses after the point where our gospel reading this morning ends. If you have a good bible you will find that those 12 verses are called ‘The longer ending’ and it will also give you an alternative ‘shorter ending’. If you have a really good Bible you will find a third ending. In fact, Mark’s gospel originally ended with this rather enigmatic verse: They went out and fled from the tomb, for terror and amazement had seized them; and they said nothing to anyone, for they were afraid. That’s it. That’s how Mark ended his gospel. We think that later scribes who copied the text for distribution across the early Church felt that a more positive ending was needed. But that’s not how Mark concluded his gospel. In Mark there is no resurrection appearance of Jesus – simply the news that Jesus is risen. And we are left with a lot of confused disciples. So why did Mark end his gospel in this way? Well, it’s important to understand how Mark portrays the disciples in his gospel. For Mark the disciples are failures – they fail Jesus, let him down, over and over. And even after hearing the good news they fail yet again. We think that what Mark was trying to do was to raise the emotions of those who listened to the text being read in their churches, encouraging them to act faithfully in order to succeed where the women and the disciples had failed. As a literary device it never seems to have quite worked, and ending on a further report of failure by the disciples seemed unsatisfactory from early on, hence the added endings. Well, we know from the other gospels that though they didn’t immediately grasp the reality of what had happened, or even when they did realise Jesus was risen they still didn’t fully understand the full significance or the event, they did in time lose their confusion. Our understanding of the story is probably the result of a conflagration of all the gospel accounts. We all know how Mary Magdalene goes and is confronted by two angels. We see Mary in our Easter garden. But she doesn’t immediately grasp the full significance of what has happened and doesn’t immediately recognise Jesus. And then as Jesus speaks to her the penny drops as she realises that her Lord is standing before her. Gradually all the disciples begin to realise that they do not need to search for a stolen body – they begin to observe what is in front of them in the light of scripture and of what Jesus himself taught. The light begins to dawn. And over the next few days and weeks the terror that Mark describes starts to subside, and the amazement turns into joy. Jesus had risen from the dead, just as he said he would, and his resurrection from the dead marked a turning point in the destiny of humanity. Is that the reaction we have? The problem is that like the disciples in Mark we often don’t truly grasp the reality of what has happened. The truth does not sink in – we see only an empty tomb, not a risen Jesus. And in a world which is often hostile or indifferent to the Christian message it’s easier to hide away. But Jesus prepares us throughout his teaching, as he prepared his followers, for the fact of his resurrection. Time and again he points to the new life which arises from endurance and faith. It is the ultimate reward for those who hunger and thirst for what is right. The resurrection is woven into the fabric of the Gospels and, with the eyes of faith we, like the disciples, are called to let it change our lives. At the end of Mark’s gospel the angel says to those at the tomb: “He is going ahead of you to Galilee, there you will see him, just as he told you.” But they fled in terror from the empty tomb. Do we, as we gather together on this Easter Sunday morning, see just an empty tomb. Do we in our own day just hide away? Or do we see the transforming power of the resurrection of Jesus and respond to the challenge that Mark set for his listeners? Do we see the transforming power of the risen Jesus who goes before us, and gives us a power which changes our lives and compels us to go out and change our world? Do we see and believe?